Link to page selling LGVA Christmas Cards and Spring notelets featuring Church Cottages, Leverstock Green. Old Barn at No 1 Church Cottages. At the very centre of our village of Leverstock Green is a terrace of four cottages which stand sentinel across the green between the two major roads to St. Albans and Watford. In their own small island of green with Church Road and the War Memorial at their backs, the Village Sign, and in spring a mass of daffodils and snowdrops in front, it is easy to look on the cottages as having always been an unchanging part of the village for centuries . Their simple vernacular architecture, their somewhat timeless quality and their very presence seems to epitomise the centre of the village. This is no doubt truer in the 21st century than it would have been in the first half of the twentieth century before the March of progress and the New Town of Hemel Hempstead had changed the appearance of our village for ever. It is easy to forget that it is less than 10 years since the appearance of the green was somewhat different, though the cottages themselves have stood much as they do today for about a century. The daffodils were only planted two years ago, and the snowdrops a few years prior to that. The Village sign was erected in celebration of the new millennium and was officially unveiled in November 1999. The war memorial has only been at its present site for years. So when did Numbers 1 – 4 Church Cottages first appear in our village and who owned them and who lived in them? 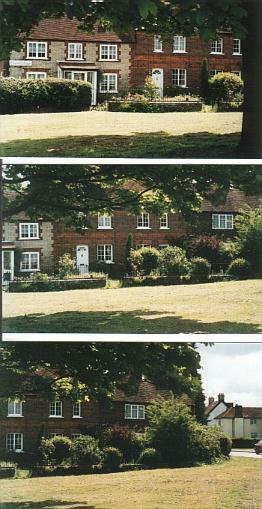 The piece of land on which the cottages stand was part of the original Leverstock Green – that is the common land or green which stretched from more or less where the church is today to where in 2004 a mini-roundabout helps ease traffic between Adeyfield Road, High Street Green and Leverstock Green Road – the point where the pub The Saracen’s Head used to stand. This common land had been providing grazing for local residents since the early middle-ages and probably earlier still, given that the green, as is the case in many other parts of Hertfordshire, was a wide swathe or verge which flanked the old Roman Road. The site of the cottages was also within the Lordship of the Earls of Verulam, being part of the Grimston Estates in Hertfordshire known as the Manor of Gorhambury Westwick & Pre; and until the creation of a Parish of Leverstock Green in 1851, was within the original ecclesiastical parish of St. Michaels St. Albans. In 2004 it is within the Borough of Dacorum, but this is relatively recent, and only as a result of changing boundaries brought about by the development of the New Town and subsequent local government reorganisation. When the above Lord of the Manor’s father, the 2nd Viscount, had commissioned a survey of his estates in Hertfordshire in 1768, none of the cottages we now know as Church Cottages existed as the map of the estates showed very clearly. 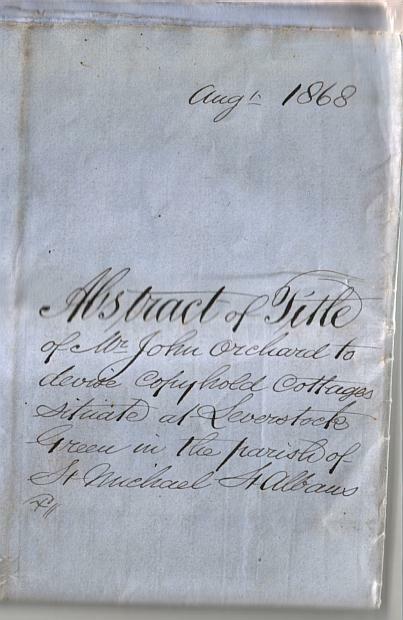 Yet by April 1792 Thomas Orchard was admitted as the copyhold tenant of the property we now call No 4 Church Cottages. He had in turn inherited from his father who was also called Thomas Orchard, the copyhold right to the cottage. 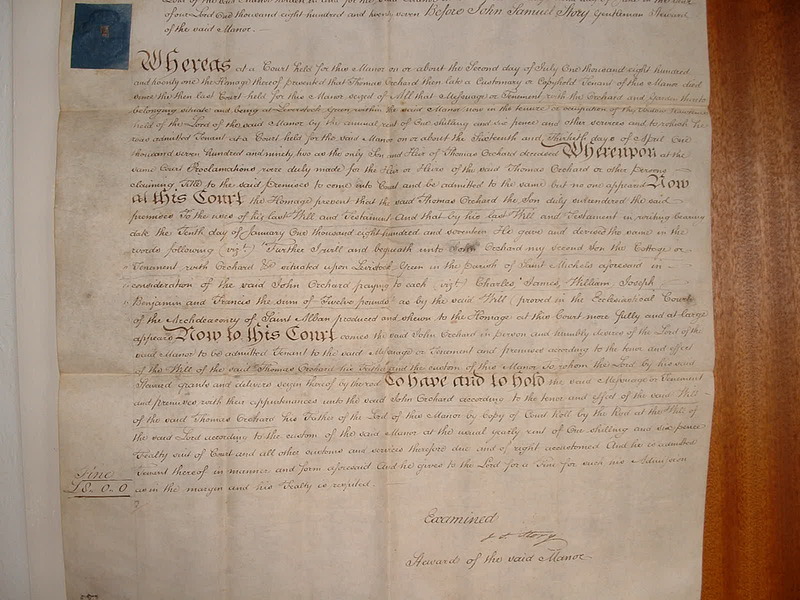 (Copyhold was similar to today’s leasehold, in that a copyholder was the legal owner of a property, but as a hangover from the feudal middle ages, owed “allegiance” to the Lord of the Manor who technically owned the land and charged a small annual fee for the privilege, along with larger “fines” when property was passed down or sold to another party.) The Orchard family were well known farmers and minor landowners in the area, and the cottage on the green would have been let to a tenant. 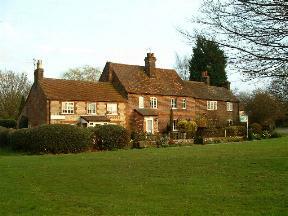 Since 1726 Thomas Orchard had leased Lawrences’ Farm off Green lane. 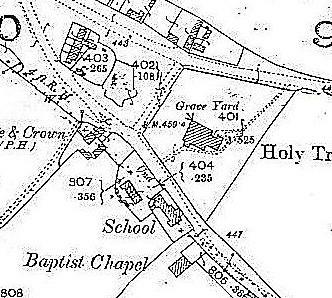 By the time of the Tithe Survey for the Parish of St. Michaels St. Albans in 1840 the Tithe map clearly shows two cottages at the site, plus the 2 village ponds which were to remain in evidence until the water-table dropped considerably in the middle of the twentieth century. The apportionment noted that the land (plot 236 - SEE GREEN BUTTON) was owned by John Orchard and occupied by John Narnes and another. At some point over the next 28 years a further cottage was added, making three on the site, as the deeds which conveyed the copyhold of the properties to Frederick Gray showed. For the sum of £250 (worth well over £12,000 today if NOT buying property, with the freehold of each individual cottage likely to fetch £200,000+ if put on the market,) Frederick Grey of the “New Drop” Inn St. Albans purchased “All that messuage cottage or tenement with the orchard and garden thereto belonging situate and being in Leverstock Green which said three cottages now or are late in the occupation of Joseph Smith Junior Jeremiah Muckle and John Dolt." The sale also included all outhouses etc. As a copyholder Frederick Gray had to pay a yearly rent of 1/6d to the Earl of Verulam, plus if required, a heriot. A heriot was a payment from an incoming tenant to the Lord of the Manor, which in early medieval times represented considerable wealth as it was usual to give the “best beast”, that is a valuable horse or cow in payment. Harrowell, Cooper and another at total rents amounting to £47 4s 8d. 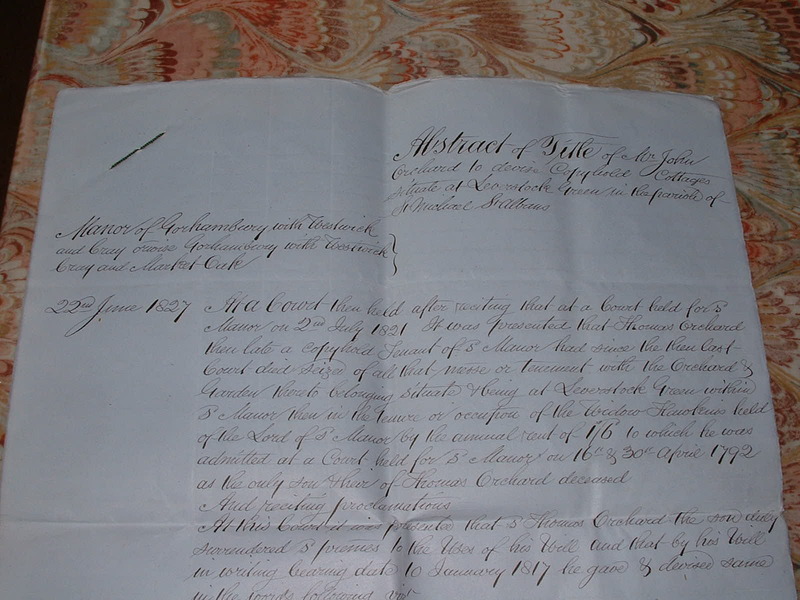 Following this auction, the Freehold of the four cottages was transferred to Herbert Finch of Corner Farm Leverstock Green for the then princely sum of £860. The cottages were then to remain in the Finch Family until November 1959 when they were sold to Phyllis Gregory the widow of Dr. John Gregory. (See http://www.lgchronicle.net/Gregory.html ) for £2,600. In these early years, what do we know of the people who lived in the cottages other than those already mentioned? We know that at the beginning of the 20th century, No 3 Leverstock Green (as No 3 Church Cottages was then known) was home to Police Constable William Sharp and his family. The 1901 census shows PC Sharp living there with his wife Alice and his nine children (Harry, Sarah, Emma, William, Helen, Alice, Winifred and John aged between 1 and 20. The youngest child, John was born in St. Michaels, presumably at 3 Leverstock Green, but her next eldest sister Winnifred aged 6 had been born in Stevenage. In fact we know from an article in the Gazette in 1904 when PC Sharp retired, that they must have moved to Leverstock Green in about 1898. An interesting ceremony took place at the County police Station, St Albans last week, when PC Henry Newman, who has for 26 been attached in the Herts Constabulary, and has been stationed as special Constable at Childwickbury for 8 years, and PC William Sharpe, who has been a member of the force for 25 years, and has been stationed at Leverstock Green for 6 years attended to draw their last pay both having retired on pension. The former by reason of is long service and good conduct has become entitled to an annual pension of £52 8s 4d and the latter £47 2s 11d.. 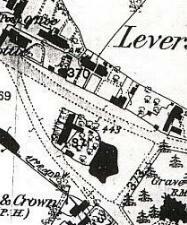 It seems likely that the Sharpe family continued to live in Leverstock Green, remaining at No 3 Leverstock Green for a time. road to Mafeking Cottages, now known as No1 & Greenside. ABOVE PC Sharpe's home,.No 3 Leverstock Green. BELOW: William Sharp outside No 3. By the mid 1970’s Dr. Gregory’s son sold off the individual freeholds to the cottages. No 4 had a demolition order placed upon it by Hemel Hempstead Council; however in view of the effect demolishing the property would have on the other three cottages the council allowed the property to be sold and renovated. After considerable renovation work (the list of necessary repairs ran to 39 different tasks and affected every room in the property), by the present owner, and much loving attention to the garden, the cottage still stands at the head of the village green over 200 years after it was first erected. My sincere thanks to Pauline Spendlove for the loan of the title deeds and other documents concerning her cottage, which has enabled me to put together this history. I am also indebted to Joan & Ralph Seabrook from Seskachewan for sending me photographs of PC Sharp and his family. Other information was gleaned from back issues of the Hemel Hempstead Gazette, HALS document D/EV/P2 - being a map of the Gorhambury Estate drawn up in 1768, (This map measures approximately 18'x24' at a scale of aprox 9" to the mile.) and the early Ordnance Survey maps of Leverstock Green. 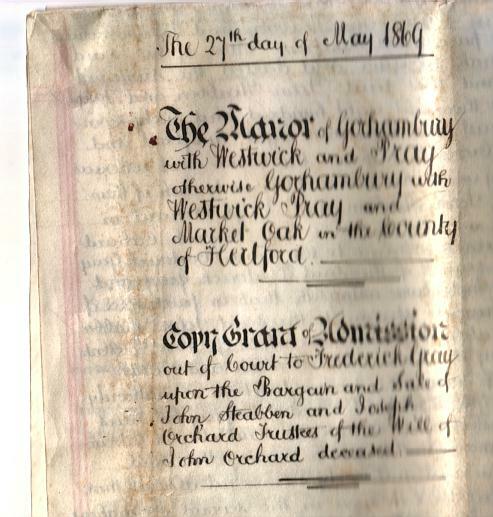 This photograph of a section of the 1840 St. Michael's Tithe Map, held at HALS was taken by Barbara Chapman, and is reproduced here with the kind permission of Hertfordshire Archives & Local Studies.